Anytime you see an error message, we recommend you take a screenshot to show us, so that we can see the exact error and the context. An easy way to find the Snipping Tool when you need it is to add it to the Taskbar that runs along the bottom of the screen. 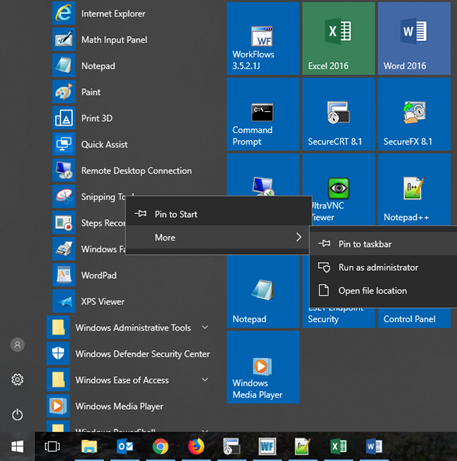 In Windows 10, you can do this by opening the Start Menu by clicking on windows icon on the bottom-left corner of the screen, going down to "Windows Accessories" to find the Snipping Tool; or, if you open the Start Menu and start typing "Snipping Tool", Windows will search for the Searching Tool and show it as a search result. Either way, once you've found it, right-click on the Snipping Tool icon, and from the menu of options, choose "Pin to Taskbar". This puts the icon of the Snipping Tool on the Taskbar as a shortcut; in the above image, to the right of the blue Word icon. (You can click and drag this icon to rearrange the order of icons on the Taskbar). So, as long as you can see the Taskbar on the bottom of the screen, you can click on the Snipping Tool and immediately capture a portion of your screen.